Garaginization has spent over a decade focused finding the best products with the best applications that deliver the very best quality for your garage floors. We strive for perfection every day. We will take the extra steps that other companies skip over, to give you a beautiful floor that will last for years to come. Many companies will suggest initial preparation of your floors by acid wash, power wash, and even a simple ’sweep and spray’ of your floors. These processes will never properly prepare your floor and you are assured to have your floor peel over time. Garaginization will only diamond grid your floors to assure the best performance of your coatings. Many companies will offer various types of products to coat your floors. Various forms of Epoxy, Polyurethane and ultimately Polyurea. These various forms will often provide a similar look initially – but over time will wear differently. Through our years of testing different products, we will only use 100% solids Epoxy and 90% solid Polyurea. We are so confident in our team, products, and process that we back every floor we install with a with a warranty against defects as well as wear and tear. Local / Veteran Owned and Operated: We have been dedicated to delivering the best solutions to our customers in San Antonio since 2008. Not a Franchise: You can rest assured that we have selected the best products available, based on performance, not on what we are directed to sell. Ultimate Protection: We cover your floor with a top coat that is life-proof. Because it is UV stable, there is no discoloring or fading with time. It is so durable that it is chemical and scratch resistant. Your floor will look brand new for years. Easy Clean Up: Our coating makes your floor water, chemical, and oil resistant. When spills happen all it takes is a quick wipe up and you are done. No stains! For more detailed information on our floors, visit our FAQ section. Very happy with Garage Cabinets, and the installation was very prompt and clean. Our Garage is now a place we are proud of. 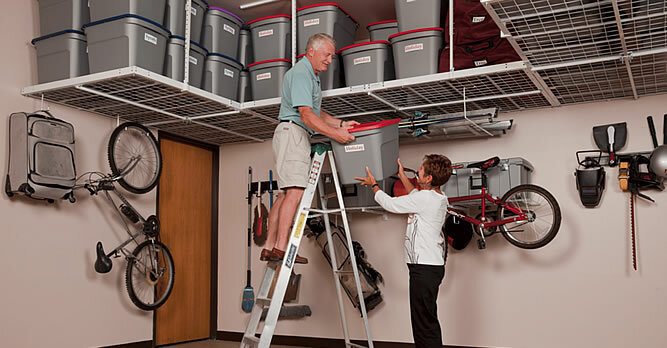 We can finally park our vehicles, and still have room to store our things where they are easily accessible. The best part is that its actually affordable. 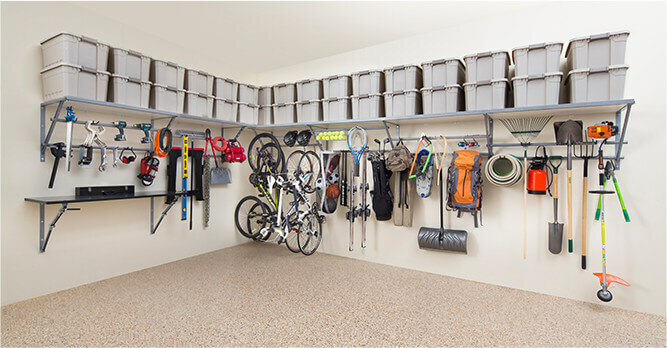 I purchased the Monkey Bars Storage system from Garaginization and I am ABSOLUTELY THRILLED with my clutter free garage! I am writing to let you know how much we are enjoying the Monkey Bars System you installed earlier this month and how much we appreciate everything your company did in the installation of the system. Don’t limit yourself to installing a floor coating only in your garage. We can install our floor coatings anywhere you think could use some protection. Patios: Protect your concrete patios around your home with an epoxy coating. This can help to prevent dangerous falls with our non-slip surface in case the weather takes a turn for the worse. Commercial Use: Office spaces, chemical labs, airplane hangers that get heavy wear and tear every day. We offer our Professional Package for just this purpose. Protect your concrete floors with a tough epoxy coating. Cracks and seams are filled and the whole floor is diamond grinded to smooth the surface & for superior adhesion in the second step. Next a tinted primer base coat is added on the top of the grinded floor. Third is a full layer of decorative chips. The chips are broad-cast for even and full coverage. Full range of colors available. The final step is highly durable, chemical, resistant, & UV stable top coat. This means it won't discolor over time, keeping flooring looking pristine. Garaginization offers the largest selection of epoxy flooring colors and styles. If you are looking for us to work with you on a custom color blend, we are happy to do so, however, we have found some of the most popular colors below most often achieve your goals. Please see below for inspiration.